I have kind of felt like I got a bit of that shock all over again the last couple of months since we moved into our new house. The one I lived in the last couple of years was a new build, low ceilings, amazingly insulated, carpet.. our house was HOT! I started sleeping in my knickers in April and not much else just cause we didn’t need to. From there I went to the States where summer time landed us in weather that was 30-41C (between 90-109F) and so I was used to heat all summer. Even with air conditioning.. we never had it that cool in the house with the air so I was used to it being warm. And then I crashed in August. Where it seemed that England forgot to have summer in August. Wasn’t August the hottest month in Ohio normally? I returned to England having no heat, and a new house. A big old Georgian house specifically. High ceilings, big and wood floors. We had to move over the summer and ended up with a lovely provision of a house. Great location, and suited all our needs. I love my housemates. I like where we live. I have friends nearby. The whole package is great! Except. It is freezing. My first night back in the house I thought I was going to freeze to death and it was the end of August. Now that it is ACTUALLY getting winter.. 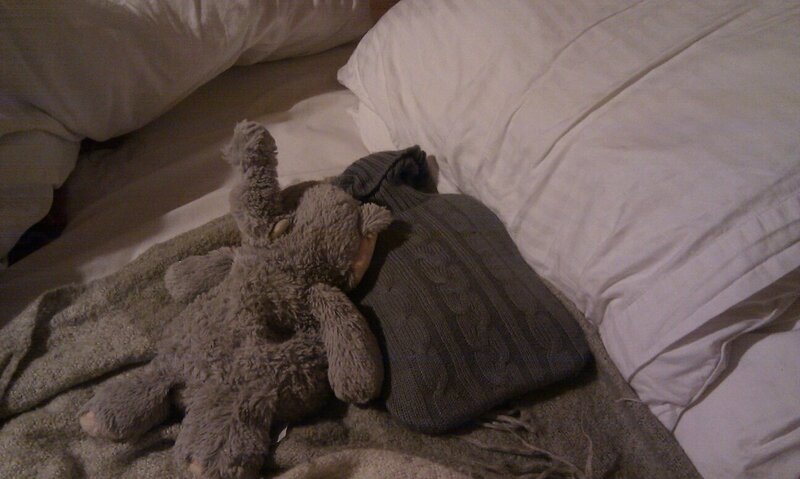 I have resorted to Elephant and HWB (hot water bottle) to try to keep me warm at night amongst my duvet and 3 blankets in our freezing big old house. I wonder if my housemates will let me get a sheepdog.